John's Beer Blog has been providing simple, straight-from-the-bottle beer experiences to the whole internet. Rhinegeist, as you may know, opened in 2013, laying claim to the old Christian Moerlein packing facility in Cincinnati's Over-the-Rhine neighborhood. This was the culmination of a dream that Bob Bonder and Bryant Goulding had held for nearly a decade: To open a brewery that would harken back to Cincinnati's roots as a brewing hub, built upon the aspirations of, largely, German immigrants. The brewery's "Our Story" page has grown substantially since the last time I wrote about a Rhinegeist beer, so I definitely recommend you check it out. Slow Jam is an IPA released in collaboration with Shake It Records (a Cincy-based record store/very independent label) that was originally released in 2017. This 6.5% ABV brew, official page here, is citrusy, piney, and dank--these aromas/flavors are due its utilization of Centennial, Amarillo, and Cascade hops. The IPA's bouquet is all hop. I get big piney and light floral notes. I'm not finding much citrus, but that's fine. When I think of an IPA, the aroma that comes to mind is exactly what Slow Jam showcases. I can't get enough of it and, apparently, neither can Purrl. She gave my bottle thirteen whiffs--she even woke up to do so--which, I'm pretty sure, is the highest rating she's ever given an IPA. From Slow Jam's flavor, I'm getting mainly citrus. It stands in stark contrast to the ale's nose: It's sweet and bright, with a malty backbone. I really like the effect of the beer as a whole. The two parts I've discussed so far are disjointed but are two sides of the same whole. An A-Side and a B-Side, if you will. Like a record. It's Record Store Day and I'm drinking a record-inspired beer. Please, give me this analogy. The third part of the beer I have to discuss is the mouthfeel. And, boy, does Slow Jam have one! It's slightly creamy--definitely fuller than I'd expect an IPA to be. In a unexpected beer with unexpected-yet-great parts, and this is yet another unexpectedly great facet. My first Record Store Day (well, my first spent actually in a record store, purchasing a special RSD release) was spent in Athens, OH during my undergrad. It was at the late, great Haffa's Records (pour one out if you're reading this and know/miss Haffa's). This was, obviously, during my record-collecting-but-not-listening phase. I went to pick up Medium Rare, the special Foo Fighters' release (shout out to the FF versions of "Darling Nikki" and "Baker Street"). The whole event was a ton of fun. I went with some friends (we got to Haffa's shortly after 10 am, which is insanely early for undergrad kids). The RSD releases were in a very prominent place, so all we had to do was head to those shelves and grab the releases we wanted. It wasn't until late-February this year that I was able to listen to Medium Rare for the first time, and, I have to say, I wasn't disappointed. Grohl & Co. always bring their "A" game. As bright and as sunny as today is, Slow Jam's bringing me back to my first, chilly, Record Store Day. Slow Jam is, without a doubt, my second favorite Rhinegeist release (Cheetah will always be number one). It's everything I want an IPA to be and has each individual's (or, at least, my) warm, vinyly memories attached to it. I'm giving it a 10/10. It's phenomenal and you need to try it while listening to a great record. Now, if you'll excuse me, I have things to do and, as Townes would say, "Heaven ain't bad but you don't get nothing done." Usually I'd talk about the brewery that made the beer I'm drinking here after the intro. But, I've talked about MadTree plenty (if you're interested in learning more about the Oakley-based brewery, hit up their "About MadTree" page). So, instead, let's focus on Stauf's today. Stauf's Coffee Roasters, as detailed on their "Our Story" page, is Columbus' first micro roaster, having started in 1988. Every small batch of their coffee is roasted by hand on gas-fired drum roasters. In this way, Stauf's gives the level of attention necessary to provide the best flavor and roast possible. Local Blend Columbus is the same base beer as its seriesmates: A 6% ABV porter brewed with lactose with coffee added. The difference in each beer, of course, comes from that coffee addition. Going into my can, I know it'll be roasty, creamy, and dark, with a hint of sweetness and a wallop of coffee. I get a heavy roasty bouquet from my can. It's almost like MadTree managed to distill the all the aromas that fill a coffee shop into a singular beer. It's deep and dark, like strong drip coffee. But there're also earthy, vegetable notes from the beans in here, but they take a backseat to the more prominent black coffee punch. The nose doesn't seem to be up only my alley; Purrl gave my can a good six whiffs. My first swig gives me sweetness (from the lactose) followed immediately by that green beany quality that Stauf's coffee give the porter. After that, a deep coffee flavor crops up--this is something akin to what you'd find a the first pour from a pot of coffee you'd brew for yourself on a Monday morning, hearty and like to wake you up from the taste of it alone. In the incredibly long finish, that earthy vegetable note from the nose lingers on my tongue. The mouthfeel from Local Blend Columbus is creamy, which is entirely fitting for the style. I always like to splash some milk in my coffee, and that's what the porter's body seems to emulate. One of the first times I ever had coffee was when Michelle and I were driving to New York for my internship (this was between my junior and senior years at Ohio University). We'd spent the night at her folks' before waking bright and early to load everything into my car. From there to New Paltz, NY--where our apartment for the summer was located--was a nine-hour drive. We weren't going to make it without coffee. After less than an hour on the road, we pulled off to go through the drive-thru of a certain Canadian coffee/donut chain. I ordered my coffee black (which is how my dad always drinks his). It was something else. Bold, strong, bitter, and hot. It did the trick. I was able to make it the rest of the way without feeling too drowsy. Maybe that's way I appreciate the deep, roasty coffee flavor in the porter so much. When I reach for a coffee porter, I want something that tastes like MadTree's collaboration with Stauf's Coffee--roasty, dark, bitter, and earthy. This is my favorite of the Local Blend series so far. While I really dug the vegetable quality of Cincinnati, and appreciated the chocolatiness of Dayton, Columbus has that core coffee taste that I crave. I'm giving my can a 9.5/10. Some local grocers still have packs of Local Blend kicking around and, although I can't speak for the Cleveland can yet, you better pick some up when you see it. The three cans I've had are definitely worth the price of admission. This is the second in a series of four posts devoted to Local Blend, a collaboration series of coffee porters MadTree recently released. I'll be judging each beer individually, comparing it to the others in the series, and, finally, rating Local Blend as a whole. Boston Stoker isn't a coffee brand I've enjoyed before. Sure, I've seen bags of their blends around. And yeah, a few of my friends like their Facebook page--some of these are big coffee folks, leading me to believe that I'm in for a treat with Dayton Local Blend. When MadTree dropped its Local Blend collaboration series last month, I was, to say the least, excited. I like MadTree, I like porters, and I like coffee beers. Why the hell wouldn't I be excited? Drinking the Cincinnati Local Blend the other day (see, each can in this collab four-pack represents a different Ohio city, and each features coffee from a company that calls that can's namesake home) only increased that excitement. So, let's go ahead and break into today's can. I've talked about MadTree on the blog more times than I can count (see their "About MadTree" page if you want to know about the company responsible for today's brew), so, instead of going into the history of the brewery, I'd like to focus on Boston Stoker for a few moments. Boston Stoker Coffee Company (according to their "Our Story" page, which, by the way, is where I'm getting all of my information) began in the mid-seventies as a tobacco and pipe shop. The owners decided to brew their own coffee to keep people in the store longer. The plan worked, and soon customers were asking for bags of coffee to brew at home. In the nineties, the clamor of Boston Stoker coffee reached new heights, and the company moved its headquarters and roasting operations to Vandalia, OH. Today, it remains family-owned and partners directly with coffee farmers world-wide in order to import the highest quality coffee beans while supporting the people who grow them. The Untappd profile for Local Blend Dayton lists it as a 5.9% ABV porter with Boston Stoker coffee and lactose added. Which means that it's a sweet, creamy, roasty coffee porter. So, sign me up. My can, by the way, boasts a 6% ABV, for whatever that tenth of a percent difference is to you. The coffee takes center stage in Local Blend Dayton's bouquet. It's rich and dark, earthy and mossy, with a slight hint of nuttiness. The roasted malt character of the porter is present, too. It's lending dark chocolate and charred wood notes to the aroma. I like it but I can't say the same for Purrl--she wouldn't deign to give my can a single whiff. This picture has a bonus Henrietta, for your viewing pleasure. This tastes exactly like how I'd expect a coffee porter to taste. It's bold and dark on the fore, like a strong cup of black drip coffee. It's roasty and earthy. The lactose in the brew is bolstering the chocolate flavor from the malt. But, the vegetative quality of the coffee beans are here, too, in the finish. This has that same quality you'd find in a vegetables from a farmer's market: green, earthen, whole. Those are odd words to describe what I'm getting at, I'm sure, but if you know what I'm saying, you'll get it. If you don't know what I'm saying, try this beer. Then you'll get it, as well. Like any good lactose porter worth its, well, lactose, this is thick, full, and creamy. Sure, there's carbonation in my can but it doesn't interfere with the way the lactose so perfectly compliments Local Blend Dayton's coffee addition. Once, while Michelle's family was visiting and we still lived in Athens, we went to the local farmer's market. This was in the parking lot of the strip mall at the end of East State Street, the street that houses all the bigbox department and grocery stores. While this might seem an odd spot for a farmer's market, it makes great sense in a weird Athens way. Anyway, a local coffee shop had set up a truck at the market that particular day. It was a cold and cloudy morning, one of the last farmer's markets for the year. I chose an espresso over a drip coffee--I'd never had an espresso before (I don't think I'd ever actually had the chance to get one) so I seized the opportunity. Something about the flavor of my beverage mingling with the crisp, earthy aromas of the fresh produce set upon the market's stands made that day stick in my memory, and Local Blend Dayton is bringing it to mind now. If you think, right now, about how your ideal coffee porter would taste, odds are your imaging MadTree's collaboration with Boston Stoker. It's big on rich, roasty coffee flavor and the lactose adds a deep chocolatey flavor and an undeniable creaminess. Comparing it to the only other Local Blend I've had, which is Cincinnati, I have to say that I still prefer Cincinnati more--that porter's flavor was unique and unexpected, the raw vegetable of its bean flavor through me for a loop and made me want more. But, I won't let that comparison detract from Local Blend Dayton's quality; it's still a top-tier coffee porter. I'm giving it a 9.0/10. It's another stellar beer in the Local Blend series. This is the first in a series of four posts devoted to Local Blend, a collaboration series of coffee porters MadTree recently released. I've had Deeper Roots coffee before. For my birthday last year, which was, coincidentally, celebrated at MadTree, my brother gave me a bag of Deeper Roots' Community Blend. It's really good stuff, and I can't wait to find out what Deeper Roots coffee adds to a beer such as a porter. You see, last month MadTree dropped Local Blend, a group of four porters brewed in collaboration with four coffee roasters around Ohio. Each can represents a different city: Cincinnati, Dayton, Columbus, and Cleveland. I'm impressed with the sheer scope of this collaboration series, and, after sitting on my cans since I grabbed them on January 5th, I'm finally breaking into them one-by-one here on the blog. The goal is to review them individually, see how they stack up against each other, and give the overall Local Blend series a rating. So, here we go. MadTree's Local Blend. First up: Cincinnati - Deeper Roots Coffee. Since I've written about MadTree so many times, I'll forego telling you about what is, most likely, my favorite area brewery. I will, however, give you this link to their About MadTree page. Instead, I'd like to focus on the individual coffee companies for this section of my Local Blend posts. Deeper Roots, as you may have guessed from the city represented by today's can, is from Cincinnati. Officially launched in 2012, their history goes back nine years before that, as a local cafe with an interest in working with Central American coffee farmers. Rohs Street Cafe led to Cincinnati non-profits the Espresso Guild and Deeper Roots Development, both of which aimed to support Guatemalan coffee farmers. Local Blend Cincinnati (the information for which I'm pulling from its Untappd page), is a 5.9% ABV porter--I'll note here that my can boasts 6% ABV--brewed with Deeper Roots coffee and lactose. So, roasty, creamy, with strong coffee notes. I'm fine with all of that. The nose is all coffee. The good stuff, mind you. Earthy and dark, with subtle hints of sticky rice and a wee bit of pine. Your typical roasty porter bouquet is here, but it isn't the star of the show; Deeper Roots' coffee is. It's a bolstering aroma and, wouldn't you know, Purrl enjoys it as much as I do. 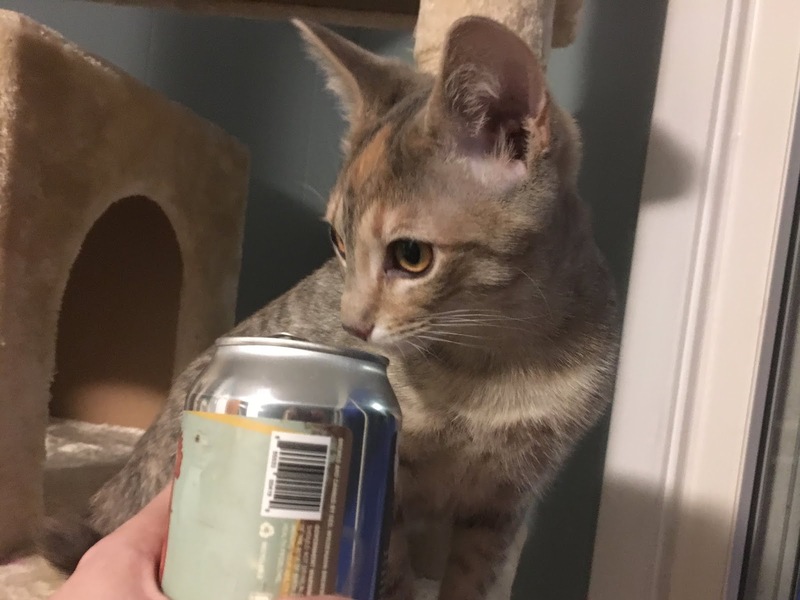 She gave my can a hearty twelve whiffs. Local Brew Cincinnati's flavors match perfectly with its nose. Everything here is dark and earthy. There's a surge of coffee up front that's closely tailed by a beany flavor--literally talking legumes here--that's borderline pea in the finish. Beyond that, it's roasty with with a slight dark chocolate sweetness. Every flavor here compliments the others exceptionally well and, although this might not be what one imagines upon hearing the term "coffee porter" (looking at you, pea-tasting finish), MadTree's pulled it all together and made an brew that's great and distinctly MadTree. This is a creamy beer. Like a coffee with creamer added, that's the level of creaminess here. And, you know what? It fits. It all fits. Do you have those little daily pleasures that get you through? You know, something you take joy in that most people wouldn't find the time or patience to do? One of mine is summer morning coffee. On weekdays during the warmer months, I get up around the same time the sun does. I walk into the kitchen and get coffee brewing before hopping into the shower. After washing myself down, I make breakfast (usually eggs and toast) and pour myself a mug of joe. I then take my plate and my mug onto our porch, where I sit at the cheap wrought-iron table we bought on clearance and enjoy my meal while the rest of the world wakes up around me. Birds sing, insects buzz, and it's warm and it's peaceful. MadTree's Local Blend collaboration with Deeper Roots sets a high bar for the rest of the series. It's coffee, earthy, and vegetative. I'm giving it a 9.5/10. So far, I'd say it's worth picking up a Local Blend pack for this wonder alone. We'll see how the other three entries fare in my next three posts.